With Valentine’s Day fast approaching, I thought It’d be fun to put together a little guide to give you a few V-Day outfit ideas and also, if head-to-toe-red happens to be a bit much for you, show different ways you can easily incorporate red into your looks without going over the top. 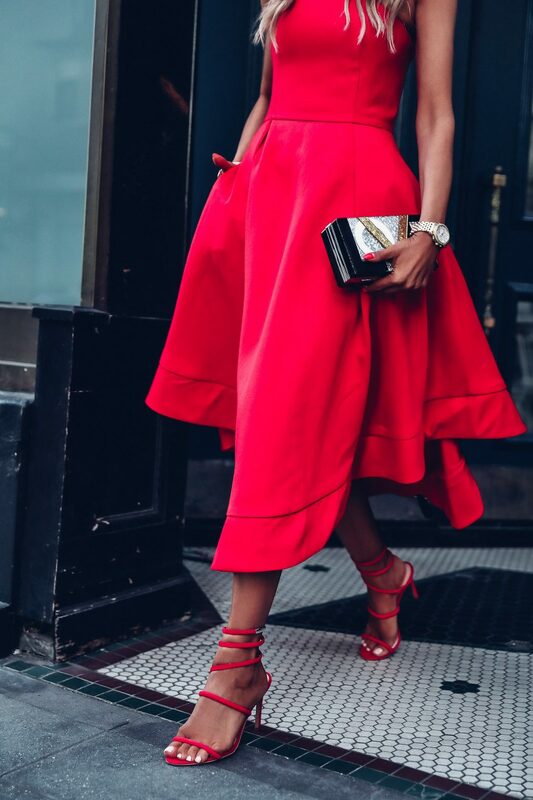 Personally, I am always a fan of a red dress, and this year is no exception of course! Typically, I look for something dramatic, elegant and timeless, yet also a type of a dress I could wear again and again. As you well know, versatility is extremely important to me. This year, the winning number comes from Bloomingdale’s, and it was pretty much love at first sight ( this particular style is sold out, similar options here & here and also on the widget at the bottom of the post ). Love the fitted strapless bodice, love the full asymmetric skirt, and especially love the pockets! Such a fun element on an otherwise very dressy dress. For today’s look, I chose to wear it with matching red strappy sandals. Though I do not typically match my shoes to my dresses, in this particular case, the combo works because it helps to elongate the silhouette and to create a a rather dramatic effect. I did consider going with a red clutch for a moment, but this cute “Love” one just seemed beyond perfect for the occasion, and did a great job breaking up the red a bit. Another way I like to incorporate red into my Valentine’s Day outfit is with accessories! 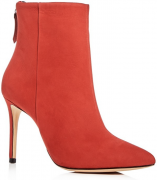 A classic red bag or a fun pair of red booties worn with an all-black look is always chic, polished and never over the top. 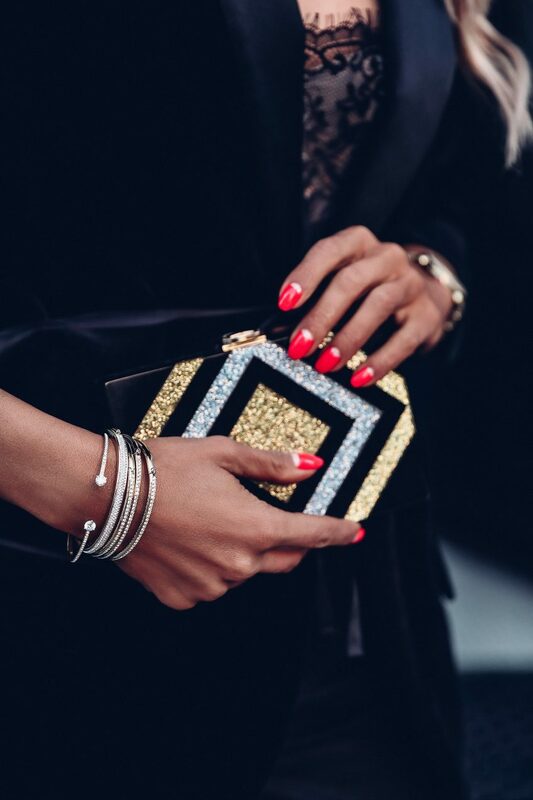 Opt for a classic red manicure ( current favorite is Dior Vernis in Pandore ) or dramatic red lip to really drive the point home. Last but not least is jewelry. 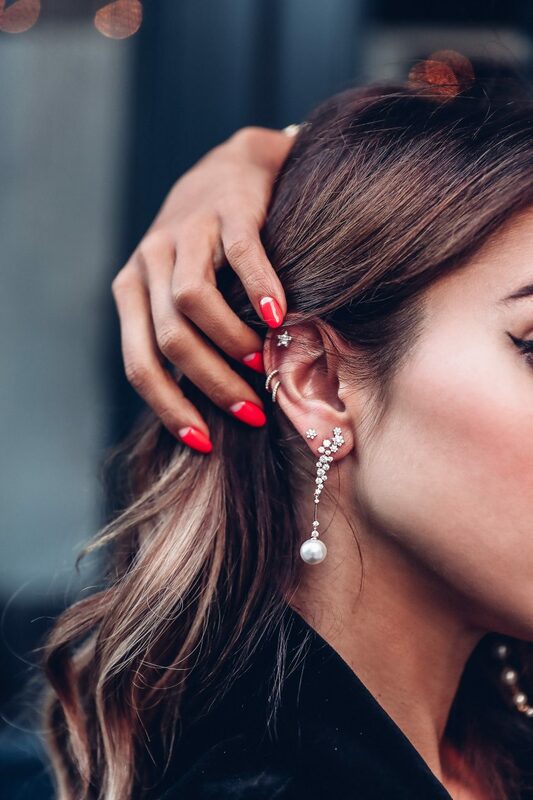 Though normally, I like to layer smaller, daintier pieces, when it comes to dressier, Valentine’s Day looks, I tend to opt for a single statement piece like a pair of drop earrings ( love these ones and these ) or a dramatic bracelet stack. I find that statement jewelry tends to add to the dramatic look of an evening outfit but also, does not distract from the main event, which is the color red of course. P.S. For more jewelry, accessory and pretty red dress options ( all under $200 ) scroll to the bottom of the page! Special thank you to ShopStyle for partnering with me on this post. I love these two loos! I love this super dramatic look you’ve gone for! Beautiful dress, red really suits you. Incredible lady in red! You look astonishing in this grand dress! This red dress is so gorgeous, you look stunning! Perfect for the Valentine’s Day! Love the pearl drop earrings! Both outfits are perfect! 🙂 You look amazing!!! I like photos too. Who makes the velvet blazer? Loveeee the earrings and piercing, omg where did you buy the 2 flowers and the 2 piercing rings? They are beautiful!!! Love all of them together!